Following training in CPR, how long is the ability to perform effective CPR retained? The ACFASP cited numerous limitations associated with their Scientific Review, including the lack of any study with actual patient outcomes. (All studies used a CPR manikin as a surrogate for human patients) An additional limitation was the lack of a standard to evaluate satisfactory or unsatisfactory skill performance. Bottom line according to the ACFASP Review – The majority of studies reviewed indicated substantial skill degradation within the first year of training while several studies suggested improved retention associated with brief (30 minute) refresher training. Cross sensitivity refers to a sensor’s ability to be affected by a gas or gasses other than the “target gas”. For example, the CO sensor in many meters is cross sensitive to hydrogen. This means the CO sensor will indicate the presence of CO when, in fact it is actually is in the presence of hydrogen. In the case of the MSA Orion for example, the reading will be about 70% of the actual PPM of hydrogen. 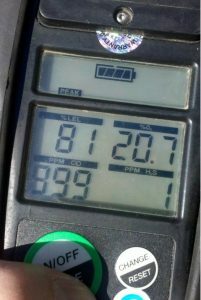 Although cross sensitivities vary across manufacturers, all toxic gas sensors in portable meters are cross sensitive to various non-target gases. The key is to be aware of what gases our sensors are cross sensitive to so we are not ‘fooled’ by an erroneous reading. Likewise, we can use this “cross sensitivity” to our advantage as is the case in the picture shown. In the corresponding photo (below), a hydrogen leak is being monitored and we can clearly see the CO sensor reacting to the hydrogen. At 81% LEL, the hydrogen has maxed the CO sensor at 999 ppm. However, the CO sensor will detect a hydrogen leak at a concentration as small as 2 ppm while the LEL sensor would require a minimum of 400 ppm hydrogen to read 1% LEL. Knowing the CO sensor is cross sensitive to hydrogen allows us to detect hydrogen at a much lower concentration than the LEL sensor alone allows. As you see, we can use cross sensitivity to our advantage if we understand it. If monitoring a suspect atmosphere, keep cross sensitivity in mind. If you enter a facility and obtain readings that are confusing or highly unusual you may be in the presence of a non-target gas. Users should exercise a questioning attitude in proceeding further until the containment can be verified. See the users manual of your meter for conversion charts and specific conversions for cross sensitive gasses as these will differ among varying models. What’s the advantage of on-site training over a quality computer based training (CBT) system? http://scs.frontend.ifirehosting.us/wp-content/uploads/2016/03/logo_revised-1.png 0 0 ifire http://scs.frontend.ifirehosting.us/wp-content/uploads/2016/03/logo_revised-1.png ifire2016-03-31 18:11:542016-03-31 18:48:04What's the advantage of on-site training over a quality computer based training (CBT) system?